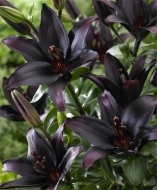 Landini Asiatic lily. Black has long been the colour most sought after by plant breeders, Landini is one of the darkest flowers you will encounter, a very deep, rich, almost velvety red-purple, If drama is what you seek to create in your summer border, plant Landini with Casablanca, Kaveri, Hiawatha, or African Queen for a powerful contrast, In a container, plant Landini with Rodolfa and be forced to ask visitors to stop complimenting you on your design skills. 2 14/16 bulbs/pkg.